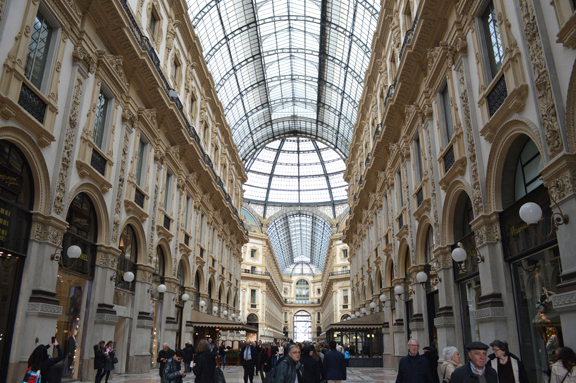 Above: Milan’s Galleria on Piazza del Duomo in the historical city center. Franciacorta is connected to Milan in so many ways. Geographically, of course: Franciacorta lies roughly an hour east of Milan by car or rail. And it goes without saying that the appellation is culturally linked to the city by virtue of shared regional traditions etc. But Franciacorta is tied to Milan because the wines of Franciacorta are inexorably associated with Milan’s fashion and high design world. And so it was only natural that Franciacorta would be named the official sparkling wine of EXPO Milano 2015, the World’s Fair that opened last week in the city. Knowing that many of you will be heading to Milan between now and October 31, 2015, when the fair comes to an end, we wanted to share a link to one of our favorite Italian wine blogs: Avvinare by New York-based wine writer and consultant Susannah Gold (avvinare means to rinse a glass with wine). Susannah lived and worked in Milan for many years, speaks Italian impeccably, and writes with great verve on her blog about Italy and Italian wines. And she’s created a new series of posts devoted to Milan, its cultural and enogastronomic resources, and EXPO. Check out her thread EXPO2015. Her blog is one of our go-tos for all things Italian wine but we’re especially excited about this current series and Susannah’s unique insights into Milan and its myriad cultural and culinary opportunities. Previous post ← The World’s Fair (EXPO Milano) is here and Franciacorta is THERE!